Artist Ian Ruhter asks the question - What would you be willing to sacrifice in order to find love? Through his extraordinary journey we learn that true love requires no sacrifice and the requirements of the question were the only thing preventing him from finding it. While working with collodion Ruhter came up with an idea to show the world the beauty of these objects in a size that was deemed impossible. This led him and the Silver & Light Team to a forgotten town on the edge of the Salton Sea called Bombay Beach, located in California’s Imperial Valley. The idea was to create a camera out of an abandoned house. The structure would serve as the framework for the camera. Instead of focusing on the decay from the outside, this house camera allowed a view from the inside into someone’s dream. Once the giant lens was placed on the front of the house, images of Ted, a 100 year old resident who recently found himself homeless, were projected in, breathing new life into this abandoned structure and once again making it a home. During this brief moment in time when Ted’s photograph was captured, he was present in both places. In reality, he was homeless in the outside world. However, the projected image simultaneously allowed him to be sitting in the living room where he was once again home. The life sized plate serves as a mirror, allowing one to reflect upon where they will be in the twilight of their life. 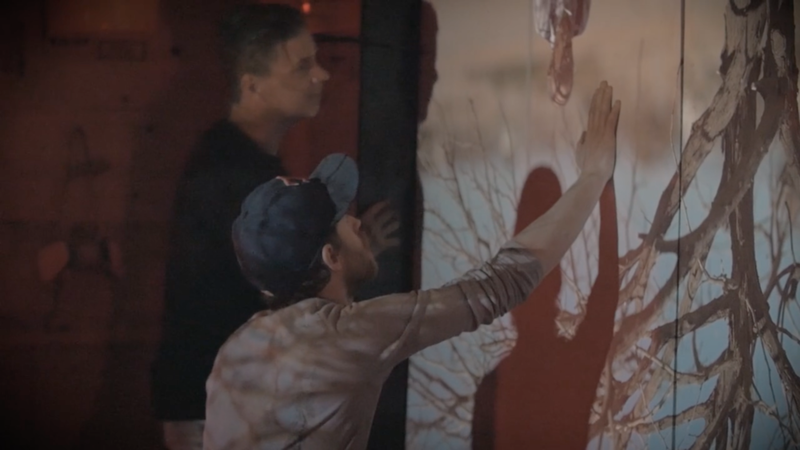 Ten seconds of this dream were recorded on a 200 pound sheet of glass coated with collodion. The result was a 66”x 90” Ambrotype, which is recognized as the world’s largest wet plate collodion image. As we move forward into the digital era we seek easier and faster ways of doing things. We’ve grown accustom to living through the artificial instead of experiencing the authentic. What has suffered most is our need as human beings to interact, touch, feel and experience life’s events together. As the digital image-making process became the new way of making images Ian Ruhter ended up spending all of his time in front of a computer editing code rather than capturing life. As this deeper shift happened Ian yearned for these human interactions and the physical things that are being rapidly replaced. Ruhter’s response to this was to embrace the past by working with a 19th century photographic process called wet plate collodion. This allows him to produce one-of-a-kind handmade photographs called Ambrotypes and Tintypes. Working from 19th century literature he was able to make his own film using USP collodion, silver nitrate, iodides and bromides to produce what he considers to be the most beautiful film in the world. The way the silver halides reflect light creates a three-dimensional viewing experience unlike any other photographic medium. In the process, Ian also questions what it means to create an original image. The advent of the collodion negative replaced what had been a one-of-a-kind object with secondary objects — prints from the negative that could be enlarged and mass-produced, making photography a commercial application. The idea of the original was lost. This shift also rendered wet plate collodion obsolete. Now, in the digital era, the photographic negative and printmaking is being replaced by code. Because digital images can be manipulated so easily, we also often find ourselves questioning what we see. Based on this perspective Ruhter engineered the world’s largest wet plate collodion camera out of a delivery truck and giant camera lens. The back of the truck served as the body of the camera and mobile dark room required to make wet plates in the field. After facing years of setbacks with the internal function and design of the camera he realized that the answer had been with him the entire time. Due to the sheer size of the camera it would allow for him to work inside the apparatus where it would become a combination of human and machine working simultaneously together. Incorporating this human element allows degrees of beautiful imperfections, ensuring that no two are alike. Rendered impossible to this point, Ruhter’s collection of tintypes and ambrotypes ranging in size from 24 x 30’ to 48 x 60” are unlike anything that has existed in photography. However, Ruhter didn’t stop there. This monumental achievement led the Silver & Light Team to California’s Imperial Valley to a community called Bombay Beach. A once thriving community in the 1950’s was filled with the hope of the American Dream was short lived as the water quality of the Salton Sea along Bombay Beach diminished and with it the possibility of creating a new desert oasis. Today, the town with its decaying buildings feels apocalyptic. From this observation an idea was born to create a camera out of one of these abandon homes. Instead of focusing on the decline from the outside this house camera would allow you to see through the eyes of someone’s dream. This abandon structure would serve as the camera’s framework. Once the giant lens was placed on the front of the house images of the outside world were projected in breathing new life into this structure once again making it a home. 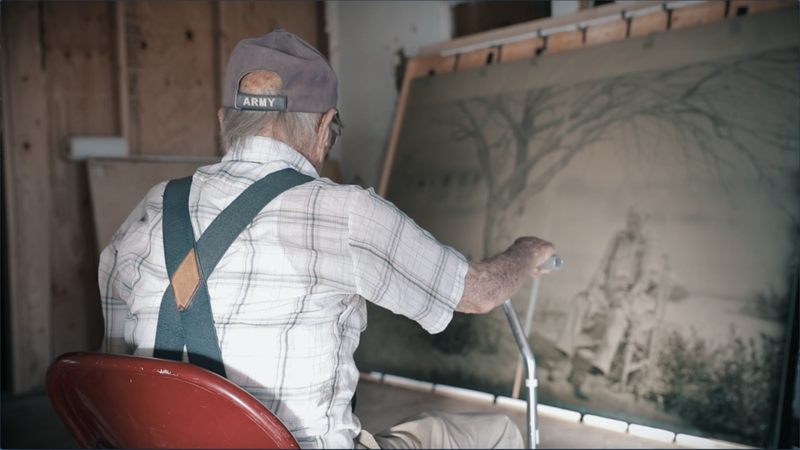 Fifteen seconds of this dream was recorded on a 200-pound sheet of glass coated with the 19th century handmade film called collodion that Ruhter began mixing almost ten years ago. Upon completion of this journey all were able to view the image in front of them a 66’’ x 90’’ ambrotype something that had not existed until this moment in time. "When a Photographer Is His Own Camera"
If, as Ansel Adams once said, negatives are composer’s scores and the prints are aperformance, then Ruhter’s modern tintypes — the images suspended in silver — are more akin to listening, with limited intervention between exposure and impression. “You learn to let go, and you get these mistakes that are so beautiful that you wouldn’t change them if you could,” Ruhter says. In their imperfections, and in their relatively high failure rate, the one-of-a-kind plates also reveal something of the unpredictable environment that is rarely captured in photographs: the moisture in the ambient air, whether the day was cold or hot and the gusts of wind that came through before, scattering dust. Ruhter, who is based in Lake Tahoe, has driven his camera across “one of the most fascinating places ever,” the United States, taking portraits and wide views of the sorts of places — Half Dome in Yosemite, the buttes of Monument Valley — that have long beguiled photographers of the American West. As we move forward into the digital era we seek easier and faster ways of doing things. We’ve grown accustomed to living through the artificial instead of experiencing the authentic. What has suffered most is our need as human beings to interact, touch, feel and experience life’s events together. As this deeper shift happened Ian yearned for these human interactions and the physical things that are being rapidly replaced. Ruhter’s response to this was to embrace the past by working in a contemporary manner with a 19th century photographic process called wet plate collodion. a three-dimensional viewing experience unlike any other photographic medium.